The weather is finally warmer and the sun is shining; there’s no doubt that summer is right around the corner. The changing of the seasons means preparation for vacations, pool parties, and one of our favorite summer activities: Grilling. No summer is complete without a few backyard barbecues and tasty grilled creations for dinner. The one thing that will bring down the joy of grilling outside (other than pouring rain) is a dirty, crusted grill plate. It’s an inevitable occurrence and if you don’t clean it once the grime starts to build, well, good luck. 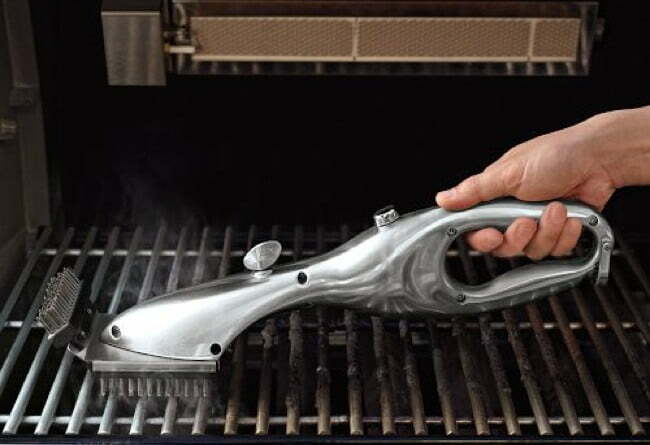 Luckily for us, Williams-Sonoma has come up with a device to help us clean our grills without using too much effort. The Grand Grill Daddy brush ($60) uses the power of steam to quickly get rid of even the worst grill residue. To use, turn on your grill, fill the handle of the brush with water, and watch as the powerful steam melts away food and buildup. Stiff stainless-steel bristles do the rest of the work, no sponge-scrubbing required.